I have often wondered about the symbols one sees at the beginning and end of texts and mantras. I've been researching them for my forthcoming book. It possible to consider these as simple decoration, but scholars of Buddhist texts and inscriptions have often interpreted them as something more. The Tibetans seem to have the most developed and elaborate forms of these, and they have a clear name for the symbol, so let's start there. Here are the Tibetan variations from the Tibetan Unicode block. The general term seems to be yimgo (i.e. yig mgo) meaning 'head' or perhaps 'header'. The first symbol is bdra rnying yig mgo mdun ma which seems to mean 'old orthography header', so-called since it is used in early texts, while the more ornate version (no.3) is used currently. [West 2005, 2006] The second is the yimgo combined with the 'following yimgo' (yig mgo sgab ma) and a shad (see below). The 3rd and fourth are the standard yimgo these days (yig mgo mdun ma). The 5th and 6th are the yimgo decorated with a shad (yig mgo phur shad ma; the shad is used as a punctuation mark and equivalent to the Indic daṇḍa); and the old style yimgo with both shad and tsheg (yig mgo tsheg shad ma), the tsheg or syllable marker is usually a simply dot between syllables, but sometimes is more elaborate. The modern Japanese Siddhaṃ has a yimgo with the same form as the archaic Tibetan yimgo. 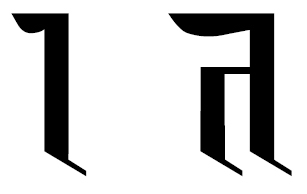 The same kind of mark is seen (right) in the Lantsa and Rañjana scripts. The proposed Unicode block for Rañjana calls this the Rañjana yig mgo which suggests there is no indigenous explanation for it in Nepal. In fact I haven't found a definite Indic name for the symbol. In older manuscripts the symbol is cruder an much more variable, but always a variation on the spiralling curve. As you can see below in the partial chart from Roth (1986) there was considerable variation. Virtually all of the possible orientations are seen in practice, including the one used in Tibetan and it's mirror image. The symbol numbered 11 is found in the Patna Dharmapada (a famous manuscript with the Dharmapada in Sanskrit); 8 at the beginning of Vasubandhu's Abhidharmakośa. Tibetan Scholars have usually interpreted this symbol as oṃ, and modern scholars seem to have followed their lead. Notice no.17 from a Pala era inscription (ca 1174 AD) which shows the two together. They are obviously quite distinct, and the two wouldn't occur together if one was an abbreviated form of the other. Others have sought to explain this symbol as an abbreviated form of the word siddhiḥ or even siddhir astu (Roth p.240). 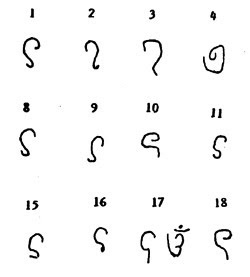 Margaret Cone for instance transcribes sign 11 as siddhaṃ in her Patna Dharmapada (p.35). Roth cite s an example of the symbol and the word found together (right) in an unpublished manuscript of the Pañcakrama (a tantric text attributed to Nāgārjuna). Roth interprets the word as explaining the symbol preceding it, but I don't see why unless we presume that the symbol means siddhiḥ in the first place. In any case this one example shows that at the time the symbol was not graphically similar in any way to how the word was written. The oṃ was in fact most likely a yimgo. Judging by the remarks by Roth and by Sander, many of the times we find oṃ in a Buddhist text which is not simply a mantra or dhāraṇī, we might really be seeing yimgo. The scribe was most likely concerned to begin with an auspicious symbol, but they did not have oṃ in mind. The scholarly consensus seems to be that the curve represents siddhaṃ c.f. Salomon (1998, p.66-68). Certainly we know that many scribes did begin copying with the word siddhaṃ or siddhiḥ, hence the name of the script, but if they abbreviated it to the symbol the proof has yet to be found. So although in many editions of Buddhist texts we find oṃ, it's prevalence might have been greatly exaggerated. Personally, I doubt oṃ was used by Buddhists before the 7th or 8th century because it doesn't occur in the Mahāvairocana Abhisaṃbodhi Tantra. Another possibility not previously considered is that it represents a snake. Symbols representing cobras appear on ancient Indian coins. To the right is a sketch of a coin from the Kuninda era (ca. 2nd century BCE - 1st CE) borrowed from the Resources for Collectors coin website. Between the horns of the deer is a sign which is described as "two cobras". You can see that they are very similar to the ancient Indian yimgo symbol, although apparently they always appear in between the deer horns. On the other side of the coin are other common symbols including the svastika, and the three jewels sign (see my post on the svastika). I wonder if the yimgo is actually a nāga? End of line or text markers are usually based on the Indic daṇḍa. The word daṇḍa means 'stick or stroke' and in Devanāgarī it is a simple vertical stroke |. In prose it is used rather variably to represent any kind of hiatus - where we might have a comma, a semi-colon, a colon, a dash, or a full-stop, in Deanāgarī one finds a daṇḍa. In Poetry the end of a pada (or line) is marked with a daṇḍa while the end of a gāthā (or stanza) is marked with a double daṇḍa ||. The earliest Indian inscriptions use no punctuation, and it took many centuries for the use of the daṇḍa to be standardised. I note that most examples of Japanese Siddhaṃ do not use any internal punctuation, but only mark the beginning and end of the text. Rañjana also has a daṇḍa and double daṇḍa (right). One has to be careful not to mistake the daṇḍa for a diacritic mark, or double daṇḍa for a ta. Mantras will sometimes, as in the Tibetan scripts, combine a yimgo with a daṇḍa or double daṇḍa. You can see how this is used in the this woodblock print. These are: 1. shad; 2. nyis or double shad; 3. tsheg shad; 4; nyis tsheg shad; 5 rin chen spungs (mound of jewels) shad; 6. sbrul (snake stroke) shad*; 7. rgya gram (cross) shad*; 8. gter (treasure) tsheg - sometimes used in place of a shad. [* displayed with Tibetan Machine Uni font]. Some of these signs have specific uses in manuscripts, and others are simply decorative. The Tibetan texts I've seen mainly use the shad, double shad and gter tsheg. The ends of chapters or texts received extra elaborate marks, but I must stop here. I will be including a longer version of this essay my forthcoming book. Roth, Gustav. (1986) 'Mangala-symbols in Buddhist Sanskrit Manuscripts and Inscriptions' in Bhattacharya, G (ed.) Deyadharma : Studies in Memory of Dr D. C. Sircar. Sri Satguru Pubs. Delhi, p. 239-250. Salomon, Richard. (1998) Indian Epigraphy: a Guide to the Study of Inscriptions in Sanskrit, Prakrit and the other Indo-Aryan languages. Oxford University Press. Sander, Lore. (1986) 'Oṃ or Siddhaṃ: Remarks on Openings of Buddhist Manuscripts and Inscriptions from Gilgit and Central Asia' in Bhattacharya, G (ed.) Deyadharma : Studies in Memory of Dr D. C. Sircar. Sri Satguru Pubs. Delhi, p. 251-262. 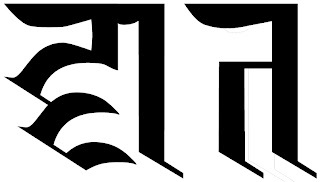 Tibetan examples are illustrated using the attractive Jomolhari font, with some help from Tibetan Machine Uni where noted. Both are free and take quite different approaches to dbu can, giving plenty of variation. 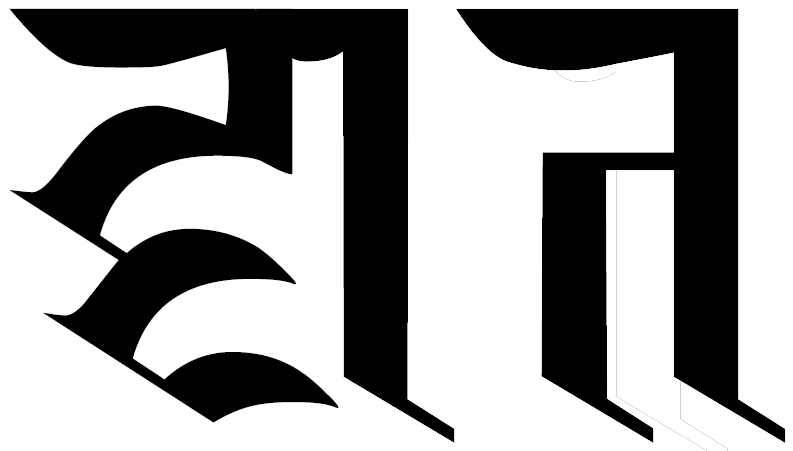 As far as I know there are no fonts for Tibetan scripts other than dbu can. For another introduction to this subject see this blog post by Tashi Mannox: The heading character and Script construction.